From childhood St. Serapion longed to lead the life of a hermit. With his younger brother, John, he set off for Parekhi Monastery, where he requested the spiritual guidance of “the spiritual father and teacher of orphans,” the great wonderworker Michael of Parekhi. St. Michael perceived in the young Serapion true zeal for a divine ministry and blessed him to enter the priesthood. Once, while he was praying, St. Michael was instructed in a vision to send his disciples Serapion and John to Samtskhe to found a monastery. The monks climbed to the peak of a very high mountain and, having looked around at their environs, decided to settle there and begin construction of the monastery. But soon the villagers chased the monks away, and the holy fathers located the exact place that their shepherd, St. Michael, had seen in the vision. At that time a faithful nobleman named George Chorchaneli ruled in this mountainous region. Once, while he was out hunting, George saw smoke over the dense forest and sent a servant to discover the cause. He was soon informed that two remarkable monks had settled in that place. Immediately he set off for the spot, humbly greeted the monks, venerated the wonder-working icon, and asked for the fathers’ blessings. After three years of construction, the monastery was completed, and the wonder-working icon of the Transfiguration was placed in the altar of the church. 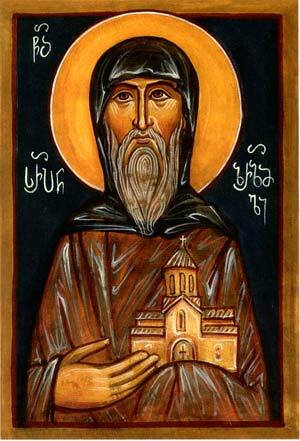 The monks fashioned cells, and St. Serapion established the rules of the monastery.